﻿﻿﻿﻿﻿The Moeland School District returned the renovated classrooms to us just in time for the August 17 opening. We are very happy to see that they have made some improvements to meet our student's needs. We hope you would also approve of the improvements. Our August 17 opening day was filled with anxious excitements and had generated all sorts of emotions, on the part of parents, of course. We trust children have ample capacity to adapt to the new surroundings. As the semester progresses, their daily experience at the school will only become more fun and rewarding. It is going to be a wonderful semester! We have very few openings available for admission after the first day, and we expect to reach full capacity enrollment soon. But we are keeping the posting of this special offer here until then. This offer applies only to tuition and is available to all students admitted in August and September, to Trust Montessori's preschool, kindergarten, grade-1, and afterschool programs. Please call for more information. 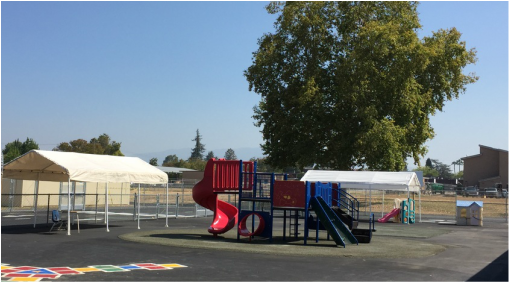 Our own large, fenced playground boarders a grassy field by the EDS elementary school. It now includes a fenced and separated two-lane driveway complete with traffic markings for preschool's little tricycle riders to have some sporty fun during the supervised play breaks. They also learn to observe and respect signs. This setup offers a unique experience only at Trust Montessori School.